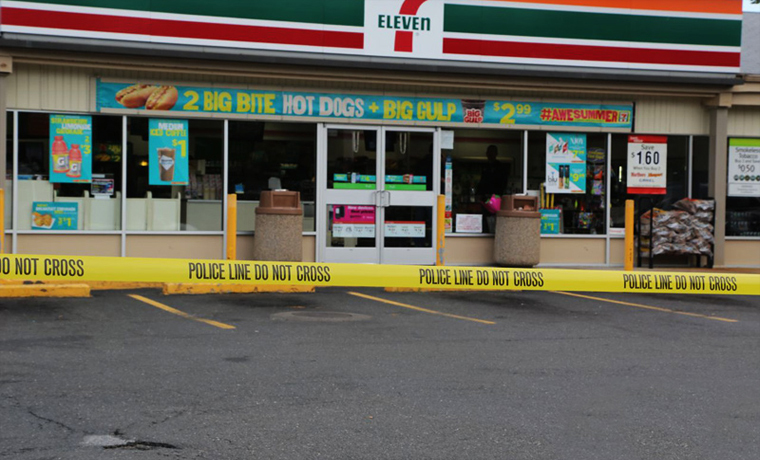 A St. Louis 7-Eleven employee found herself in an early morning shootout with an armed robber Monday, that left one dead. The female worker involved in the shootout had stepped out of the store at for a smoke break when an armed man tried to rob her at about 3:50 a.m., according to police reports. But the robber was unaware of just what the worker was bringing to the fight until she pulled out a gun of her own and exchanged fire with the would-be robber, killing him. The robber was shot in the chest, arm, and thigh, police said. He died from his injuries at St. Louis University Hospital. Police on Tuesday identified him as Derrell L. Mayes, 30, of the 1500 block of Varnum Drive in Dellwood. He has a criminal history that includes burglary, assault and gun charges. The woman, 35, whom police have not identified, was shot twice in the leg. Police said she was conscious and breathing when she was taken to a hospital, where she was stable. Her medical condition was unavailable. The store, in the city’s Carondelet neighborhood a few blocks west of Interstate 55, was open for business about two hours after the shooting. Employees said Monday evening that the woman involved in the shooting had worked at the store for years. A man who had been working with her at the time of the shootout quit later that morning, employees said. Brian Richardson, another worker, spent the morning answering messages and calls from friends who heard about the shooting and wanted to know what happened and to check that he was OK.
As of right now, it appears that the employee will not be charged for a crime after the shooting, as the police are deeming it justified. What do you think of this employee? Have you ever had an issue working late night at a job? Let us know in the comments below. Should there even have been a question rather she had the right to defend herself? In today’s Liberal litigated society, it’s even a wonder that they don’t incarcerate honest victim’s for calling police for a robbery in their homes or for assault ! Unfortunately, they do arrest and incarcerate victims of home invasion/robbery if they don’t follow the law as it relates to use of deadly force. That’s why it’s so important to know the laws of your state and jurisdiction, before using a weapon to defend yourself or your home. As long as there are left wingers/proressives, the move to disarm the world…except for the pols, billionaires and and actual criminals (or did I repeat myself! ),,,will continue. Now matter how much we move ahead, the move to disarm citizens will never cease. She saved her life by carrying a firearm, otherwise, she would be dead for now. If this fact does not appear for our liberal dumbhead morons as another proof of justification to bear arms for US people nothing is would. Poor brainwashed shiplets, shame on you! The problem is that Southland Corporation, the owners of 7-11, typically have a written clause in the employment contracts that specifically denies workers to possess firearms while at work. She may not suffer prosecution, but it is likely she will lose her job as history suggests. Yes, this is wrong. And this is why I don’t carry one. I have been held up twice, where once the perp was killed by police and once I was the manager handing over the cash and they got away. Both times I was working in a place that denied employees the right to carry for their own protection. Now, I am back working for the 2nd company again, and I fear another robbery. It’s why I hate retail. I am, however learning Taekwondo and self defense just in case- I am a female, and therefore more likely to get picked for an attack. They’ll be surprised if they choose me, but I truly wish I could carry my little .38 just in case. Alas, California also does not want me to even OWN the gum, or the ammo, let alone actually carry it so it’s handy when criminals come knocking. God forbid we become a sanctuary state. I may break some work rules then. It’ll be worth losing the job. I feel for you. Living in commiefornia has got to be hard. Maybe you can make like other sensible people and move. Karate vs a gun still isn’t a fair fight, check out Target Focus Training and Tim Larkin. There you will learn to use the tool of violence and the only weapon you have with you 24/7, your brain. Karate teaches many moves and techniques, some complicated and take years to master. TFT is the simple application of violence to targeted areas of the human body that result in non-functioning. They say, when violence comes for you the only response is greater violence. In this case smarter violence. Check them out. I hope she had a lawyer with he when she talked with the police…. 1. NEVER, NEVER talk with 5-0. If you shoot someone are use your gun. Just say you were I fear for your life. And you want a lawyer. And then shut up. Until you have one with you. Use your rights. 2. She will now lose her job. Good old 7-11 has no back bone. 3. The thugs family will sue her. Saying she had no right to use her gun. And they just might win. Pack heat. Know when & how to use it. Don’t count on 5-0. They come after the fact. I don’t know the armed citizen or her background. But she was working an honest job trying to make a living and there is no evidence in the article that she was carrying a gun illegally, so I see no reason whatsoever to find fault with her actions to protect herself. Stepping out alone at 3am to smoke a cigarette in a neighborhood where the store had been robbed before was probably not a good idea, but in truth, she had every right to expect that she could do so without some scum bag attacking her. People have a right to live their lives in peace. Final outcome . . . one less scumbag in the world. I’m glad she won the fight. St. louis cops are pretty much on board with concealed carry despite their recently outed chief who has spoken out against it. The real problem here is the city is almost purely democrat. Which means we have a large majority of liberal prosecutors and judges. Both have historically been against the citizen victim and for the criminals by allowing ridiculous plea bargains and a revolving door jail. No, her troubles aren’t over. There’s a brand new Mayor also who started her campaign vocally anti-2nd Amendment and outrageously stated that she wanted to reclassify “assault weapons” as any gun that held more than 5 rounds and ten enact a magazine limit of 5 rounds for a gun ban. None of our troubles are over. Gang violence and a revolving justice system with minimum penalties has pumped up the murder rate and ag. assaults. Add to that the open door policy for refugees and illegal immigrants, it’s a wonder we’re not setting records like Chicago. The public is more informed and in favor of concealed carry than our so-called leaders. Maybe AG Jeff Sessions will make an example of this place and show what happens when the government gets tough on gun crimes, which has been lacking to date. If this happen in the criminal friendly Northeast, she would go to prison. The criminal would be painted as the victim. The prison system is a joke, except when it comes to putting the good guy away for using a gun to save his / her life. Then they send you away for life. Your suppose to a good victim and let them kill you. I applaud the employee for taking the initiative and protecting herself. However, I can’t help but wonder if her place of employment will allow her to remain employed having brought a gun to work. A similar situation recently occurred at a circle K in Albuquerque, NM. The employee had to defend herself shooting the armed robber. However, circle K forced her to quit because that wasn’t their policy in handling a robbery. We need to stand together and force these places of business to either provide security for their employees or allow the employee to provide for their own safety.